Rambert School dates from 1919 when its founder, Marie Rambert, first began teaching in London and it is now recognised as one of the world’s finest centres of professional dance education. Uniquely in the UK, the Rambert School of Ballet and Contemporary Dance treats these two dance genres equally. 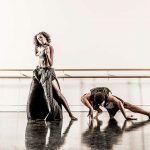 Providing an intensive dance training and a stimulating educational environment, Rambert enables talented students to fulfil their potential as expressive performers, creative artists and as human beings. Marie Rambert famously proclaimed that her School should not be a ‘sausage factory’, and this sentiment still holds true. Individuality continues to be highly valued and each student is nurtured and supported throughout their transition from dance student to professional, and often beyond. Rambert School of Ballet and Contemporary Dance joined the Conservatoire for Dance and Drama in 2005. The School offers a Foundation Degree and a BA (Hons) in Ballet and Contemporary Dance. The School welcomes applications from disabled people and offers places solely on the basis of potential and suitability for a career in any of the areas taught. Some of the School premises are not accessible for wheelchair users. If you would like to discuss your access needs before applying, please contact Judy Bowden, Head of Admissions, Registry & Student Support on info@rambertschool.org.uk or call +44 (0) 208 892 9960. I feel that Rambert School instilled a certain mentality in me as an artist. That to be a successful dancer, you must go beyond what you may think is good enough. You have to be an intelligent dancer, someone with diligence, determination, persistence and a certain understanding of who you are as an artist or who you would like to be.